Have you ever woken up in the morning and felt like you had just spent the whole day hiking in the wilderness?……What if you actually had? And worse, what if you had another full day ahead of you? Anyone who has tried to catch 40 winks under the stars knows how hard it is, especially if your back and joints aren’t as spry as they once were. The most grizzled forest veterans know that a good night’s sleep is key to full day’s camping experience and that it’s impossible to have a rejuvenating sleep on the hard ground. If you don’t wake up fresh and free of pain, you won’t get the fullest experience possible (and you might never try again!). A blow-up mattress lets you bring the comforts of your bedroom to the great outdoors. The best sleeping air beds for camping range from simple, inflatable mats perfect for budget backpackers to Space-Age wonders complete with everything except a microwave. With one, you can appreciate the starry night skies in the lap of luxury and wake up the next morning rested and ready to take on anything that nature brings. Read our comprehensive guide on top air mattresses to know what to look for when making your purchase. A portable, inflatable (portflatable?) bed is such a great idea for camping, that the main drawback is the sheer amount of models to choose from. To make matters worse, if you get it wrong, you’re stuck with it the whole trip. That’s why we’ve scoured the web to find the plushest, most convenient, most luxuriously comfortable inflatable mattresses. If your goal is the best camping experience possible, don’t forget to consider packing one of these into your car. Have you ever tossed and turned in your sleeping bag wishing you had brought your bed from home? Well, now you can. 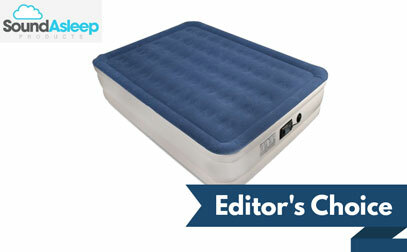 The SoundAsleep Dream Series air mattress lives up to its name and then some. Its 40 internal air coils make it an ideal choice for the avid camper who suffers from frequent joint and back pain, as the coils help ensure the mattress keeps its form so you can stay sound asleep throughout the night. The outdoor community has been raving about its laundry list of features that help it stand up to the rigors of nature: a powerful internal pump for quick inflation and deflation, strong bottom grip to keep it in place during the night, and an extra-thick, water-resistant top for added comfort and protection. All of the pros make it easy to deal with the minor motor noise from the pump and its non-compatibility with standard sheets. Lightweight, portable, and capable of withstanding rain and rough terrain—this budget-friendly model combines the comfort that a camper desires with the portability that a backpacker requires. The built-in foot pump saves valuable space inside your bag and can have this bad boy ready to sleep in under 5 minutes flat. Unroll it, pump it up, and get ready to gaze at the stars from the comfort of 192 stabilizers. When you wake up rested and ready to move, deflate it in a flash, roll it up, and put it in the carrying bag that it comes with. Not only will you be sleeping in Mother Nature, you’ll be protecting her, too. The only thing this environmentally-friendly bed will do less damage on is your wallet! The majority of campers love its combination of mobility, convenience, and comfort. It takes a bit of effort to pump and some getting used to, but once you get the hang of it, you shouldn’t have any issues. When life throws you curveballs, it can help to have an inflatable camping bed from Sable. The advanced coil beam construction allows for a high level of comfort while still maintaining the flexibility and versatility that has made it a hit across the outdoor world. In fact, it might be the most ideal camping mattress for couples due to its multi-stage inflation settings and weight capacity. It takes only 3 minutes for this air bed to have the strength to support two people, and if you find yourself in a pinch, you can fit 3. One satisfied customer even slept 4 people and lived to tell the tale! Despite its strength, it folds down fast for easy storage. Its price point is a shade above other models on the list, but if it sleeps 3 comfortably, then you’re getting 3 beds in 1! The only caveat is that the electric must be plugged in, so have a manual pump handy. EXTRA BONUS: If you’re scared of critters in nature, this towering mattress keeps you high above ground and out of harm’s way! The twin-sized model from one of the world’s leading mattress brands doesn’t disappoint, and where its larger cousin falls short (or “tall” if you want to be technical), this more petite version excels. The full-size SoundAsleep is designed for ultimate comfort, but takes up quite a bit of space and is a bit cumbersome with standard sheets. Not this one. This twin camping bed comes with all of the frills—ComfortCoils for a deep, sound sleep; 1-click internal pump for inflation/deflation in minutes; double height design and “sure grip” bottom to prevent sliding in the tent, and castle-wall durability—but is tiny enough to fit in tight spaces and your standard sheet fits snugly over it without a fight. Customers are in consensus about its dreamlike comfort, and it makes sense for a solo camper due to its smaller size and, more importantly, smaller price tag. The pros make it worth the price and easy to let the mild initial PVC stretching slide. Want to have the bed all to yourself but don’t want your little one(s) sleeping on the hard ground? 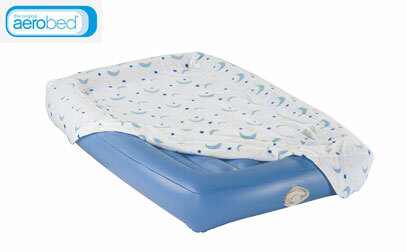 The AeroBed kid’s inflatable mattress is specially made for children, and sports electronically welded seams and heavy-duty PVC for waterproof protection. Where the bed really shines are the safety cushions on either side. When your child is surrounded by the extra plush padding, they aren’t at risk of falling off and get a much deeper, safer sleep. AeroBed made this model with convenience in mind. Need to put a cranky toddler to bed at once? It inflates in under a minute. Did someone have an accident because they were too scared to venture out of the tent at night? That’s alright; the mattress cover is easily washable. The added comfort of the mattress top and cushions does create more sound if your little one moves around in the night, but the bumpers on either side help keep them in place. So there you have it. The top rated camping mattresses that are available on the market in 2019. After painstakingly researching, testing and putting all of the greatest mattresses in one place, there isn’t anything else we could possibly do to make the buying process easier for you…….right? Scroll down for our inflatable mattress buying guide! Price/Quality – Sometimes, you get what you pay for. It’s up to you to find that sweet spot between bodily comfort and wallet happiness. There are plenty of great models in all price ranges, but, in general, the higher you go, the more you get. Also, don't forget to consider a memory foam camping pad because it's one way to be even more comfortable. Size/Capacity – Are you a family going on your once a year vacation or a backpacker whose bag space is at a premium? Convenience – Most models come with built-in pumps, but if they don’t, are you prepared to do things the old fashioned way? Weight/Mobility – If you’re going on a trek, you want to be mobile. You’ve got to not only consider how heavy it will be to carry, but how quickly you can inflate and deflate it. Your Body – Are you prone to back pain? Then you need something with more support. Are you young and spry? Then you could make do with something a bit less fancy (and less expensive). You don’t want to purchase an inflatable bed for comfort only to for it to make your camping trip less enjoyable because your legs hang off and you can’t sleep on your side. Escaping modern conveniences and getting back in touch with our roots are just part of the reason why adventure-seekers and average Joes take to the wild outdoors. Camping is great exercise, soothing for the mind, and a bonding activity that friends and families alike can partake in, usually for much less than a short vacation at a nearby attraction. Studies have even linked camping to better overall sleep and life quality (will link later). But it’s all fun and games until your back hits the ground. If you aren’t well rested, you won’t be able to take the bull by the horns during your trip, and, to make things worse, you may have a few bumps and bruises that will last long after your tent is packed up and work your clothes are back on. An air mattress can erase all of those issues and more. If you’re wondering about the benefits of owning one of these nifty inflatable beds, then here are just a few. Are you feeling irritable, lethargic, or anxious about your trip? It’s probably due to lack of sleep. If you wake up in the morning and don’t feel like joining everyone around the table for coffee and breakfast, then what’s the point of going? A battery powered air mattress will help you get a deep sleep regardless of the scary noises coming from outside (it’s probably not a bear…probably). With a full, revitalizing sleep, you should feel that lust for the outdoors that you felt the first time you went. Anyone who has ever gone camping knows that back and joint pain are almost unavoidable. Any time you are out in nature, there is a risk to feel a bit sore. However, the last thing you want is to be so sore that you can’t go hiking or play frisbee in the evening. If you sleep on the hard ground, that’s very likely what you’ll get, especially campers whose bones aren’t what they used to be. An air mattress will allow you to bring the comforts of your home bedroom into your tent and keep your trip pain-free. Having unexpected guests? Are the kids having a sleepover? Do you not feel like transforming your home office into a guest bedroom? The majority of the models on this list can be used indoors, too! If they’re comfortable enough for a deep sleep while in a tent, then they’ll be twice as good inside the comfort of your own home. The best part is they won’t take up any space at all if you deflate and store them. Are Cat Proof Air Mattresses Durable Enough to Use? A few companies have analyzed the pet proofing dilemma and come up with solutions that can help keep their brands safer from the rogue claws and teeth of housepets, and they include specialized covers or extra durable rubber. These features can also make the structures plenty durable for outdoor use, but you should keep in mind that these features also make the products quite heavy. Will Intex Brand Products Work Outside? There are some Intex brands that are better suited for outdoor use than others, and this largely comes down to their weight. Extra features in some models, such as interior supports and thick rubber, add a lot to the air bed’s overall durability, but it could be quite cumbersome to carry if you’re hiking outdoors to your favorite camping spot. It’s best to evaluate the weight and bulk when selecting a bed for outdoor use. Choosing the right tent mattress is hard. The ground outside is even harder. If you don’t do the first sentence right, the second sentence is going to become all too real. 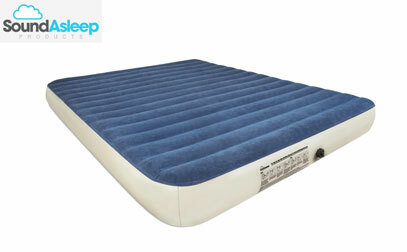 Purchasing a top end air mattress for 2019 will help you get a deep sleep under the stars, get rid of your pain, and give you handy spare bed to use in a pinch at home. Make sure to set a budget, weigh the size, convenience, and capacity options, and go into your search with an open mind. If we had to choose one, it would be the full-size SoundAsleep Dream Series. The comfort and durability are high. It truly is like taking your bed at home and bringing it on your trip. Have you ever woken up in the morning and felt like you had just spent the whole day hiking in the wilderness? With an air mattress, you’ll probably never have to. Or if you're now confident to get a new bed for your home, you can check out some of our top picks for 2019. I am thinking you don’t do much camping or remote camping, since it’s hard to have an electrical outlet in tent, unless you carry a generator or charge pack. 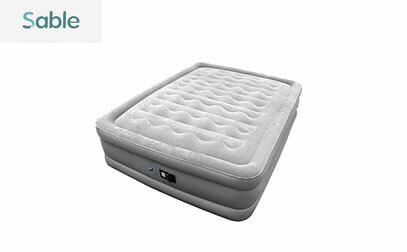 A true camping mattress with have pump that can be charged or a manual pump.